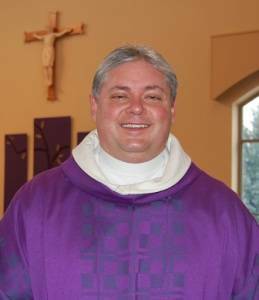 In addition to his service as a deacon at St. Thomas, Sean Smith is also the Chancellor of the Diocese of Knoxville. As Chancellor, Deacon Sean works closely with Bishop Richard Stika on a daily basis-- assisting the Bishop in his duties and travels with him throughout the diocese and the world. Born in Colorado Springs-- Deacon Sean grew up in Black Forest, Colorado. His educational background includes a B.S. degree at Colorado State University, an M.S. degree at California State University, seminary formation at St. Meinrad School of Theology and a Canon Law Certificate at St. Mary University of Minnesota. Deacon Sean lived in Southern California before moving to Knoxville. He is married to Melissa, and they have two boys, Riley and Keegan. He loves snow skiing, boating, traveling, eating and spending quality time with his family. Deacon Sean also loves the Catholic Church and says "I feel privileged to serve God and the faithful of Tennessee."